This sculpture, Welcome to the Wheel World by Ela Lamblin, decorates the front plaza at Beacon Hill International School (the school building isn't showing in the picture). Photo by Rob Ketcherside in the Beacon Hill Blog photo pool on Flickr.com. Have kids starting kindergarten this fall? Beacon Hill International School invites you to tour the school tomorrow, Tuesday, February 28, or on Thursday, March 1, from 9:15 a.m. until 10:45 a.m., starting in the school’s Multipurpose Room A. There will be a brief presentation of program highlights followed by the tour of the school building. Registration is not required. Please note that no child care is provided. 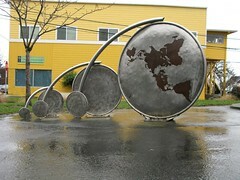 Beacon Hill International School is located at 2025 14th Ave. S.
What a great sculpture . As A non-parent, congratulations on having a preview of the school and kindergarten school. What a nice way to also get the children acclimated to the surroundings and people. Further ,how great to have parents come to take a tour. I have to add , what a terrible school tragedy in Ohio. Non-the-less I feel so badly for the dead child,whose home will never be the same. But also for the disturbed boy, whose life will never be the same either. in the home. Not to mention leaving a gun anywhere, where he could get at it.